(W/A/CA) Dave Sim Intellectual, entertaining, and though-provoking, Cerebus was the longest running independent black and white comic of all time! Cerebus, a small, gray, and chronically ill-tempered aardvark, makes his living as a barbarian, but soon his adventures will lead to much greater things! This trade paperback reprints some of the most popular Cerebus storylines (many of these issues sold out almost immediately), as Cerebus makes a return to down-and-dirty swordplay. Reprinting Cerebus #187 through 200, 'Minds' brings the 1,000 page Mothers & Daughters storyline to a surprising conclusion. 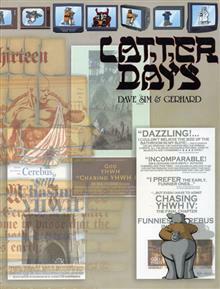 Included are appearances by the Young Cerebus, Jaka, and others. This edition is available in two different versions: a signed and numbered first printing, and an unsigned second printing. Dave Sim's Cerebus began as a parody of Conan, but expanded and grew into much more! Intellectual, entertaining, and thought provoking, Cerebus was the longest running independent black-and-white comic to be published! This remastered edition of volume 13, Going Home, collects issue #232-250 (1998-2000). 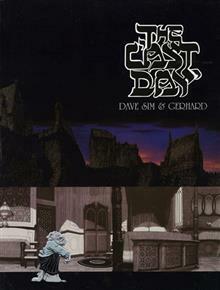 Follow Cerebus' last days on Earth as he deals with debilitating aches and pains, memory loss, political turmoil, indigestion, and incontinence in the final two volumes in Comics' first 6,000-page graphic novel. And when, exactly, is his son going to come to pay a visit?! Includes complete annotations by creator, Dave Sim. The 240-page conclusion to comics' first 6,000-page graphic novel. Follow Cerebus' last day on Earth as he deals with debilitating aches and pains, memory loss, political turmoil, indigestion, incontinence, and when, exactly, is his son going to come to pay a visit? Includes complete annotations by Dave Sim.